As most of you know, I tend to be different. It shows up many ways. Today it is showing in this quilt block. 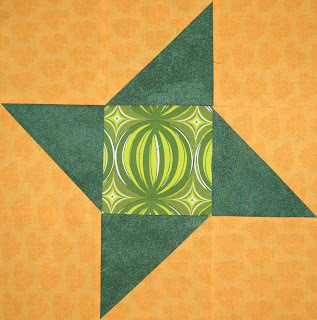 I made the block for the Beginner's Quilt Along - Block 5. After reading all the directions and making sure I knew what I was doing, I cut the fabric and started sewing. The block was finished and I thought it looked great. I fussy cut the center and put it together pretty darn well. EXCEPT- I looked at the directions again. Hmm, mine doesn't look right. Moving right along I uploaded it to Flickr and added it to the group. Ha ha. It could be said that I often take the path less traveled. It seems my block is spinning in the wrong direction. Oh well, it will be just fine in the quilt. Now do me a favor; let's just keep this between you and me, okay? Maybe no-one else will notice. Each entry must be a BRAND NEW piece never published or blogged about..
You cannot blog about the creation or discuss it in any forums you may belong to. Mums the word in all entirety this year! If you get caught abusing this very important rule, you will be disqualified. Since those are the rules, I will just say that this should be a great show and I hope you will go and vote for your favorite quilt. I will remind you when the show starts. Also, please encourage any male quilters you know to consider entering. At least you have a great sense of humor about it and didn't take it out. Hmmmmmmmmmm.....lol...looks like something I might have done. I love the fussy cut center. I will be sure and check out the men's quilt show. It will be fun! Looking forward to Men Quilt Too. Right now I'm reading throgh the 'Male Call: Quilts Made By Men' catalog my sister brought back from the Rocky Mountain Quilt Museum exhibit this past Spring. 39 quilters represented there. Hope to see some of them here. I just think the others blocks are probably spinning the wrong way....:) Looks great especially with the fussy cut. Not talking about what I am quilting is going to be really hard. I like to talk. I should go buy some duct tape for my mouth.